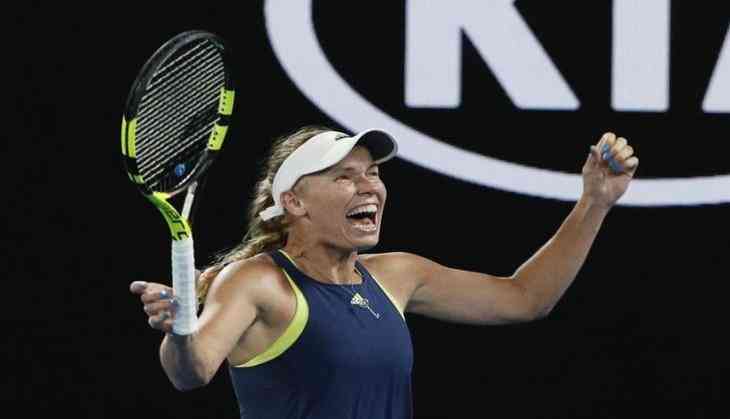 Danish tennis star Caroline Wozniacki produced a spirited performance as she bounced back from a set down against top-seed Simona Halep of Romania to clinch this year's Australian Open title here on Saturday. After comfortably winning the first set, the world number two went down in the second before she rebounded strongly to clinch a 7-6 (7-2), 3-6, 6-4 win over Halep, in a thrilling summit showdown of the women's singles event that lasted for two hours and 50 minutes. The victory saw Wozniacki bag her first Grand Slam title at the 43rd attempt and, now she would replace Halep as number one in the world rankings on Monday. Wozniacki, who has twice been a runner-up at the US Open, has also become the first Danish player to win a Grand Slam singles title.